The guitarist has published a self-titled photographic autobiography of more than 600 images, researched and curated by Jimmy himself. He admitted that even before he began the project three years ago, he still had an encyclopaedic knowledge of the band's touring schedules, gigs, recording and radio sessions, partly because he's "a real hoarder". "I've got all the memorabilia and paraphernalia from the time. I've got all the outfits I ever wore on stage, even the stuff I was wearing as a session player," he said. "But it's good clobber!... really cool clothes. I'm slim now, but even so, I can't wear any of it, not when it comes down to the dragon suit I wore on tour. But then, we were doing three-hour shows for years; it was like a workout running around stage every night." 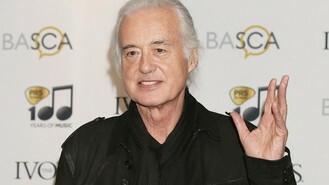 Jimmy said that a Led Zeppelin reunion probably won't happen, admitting "it doesn't look likely". "It seems to be more problematic than something that should just be a natural event," he said.